How to let loose: the 2 MINUTE Gesture. It’s been about 2 years since I’ve properly attended a life drawing/figure drawing class. But tonight I was rummaging around underneath my bed and I stumbled upon my old art pad. 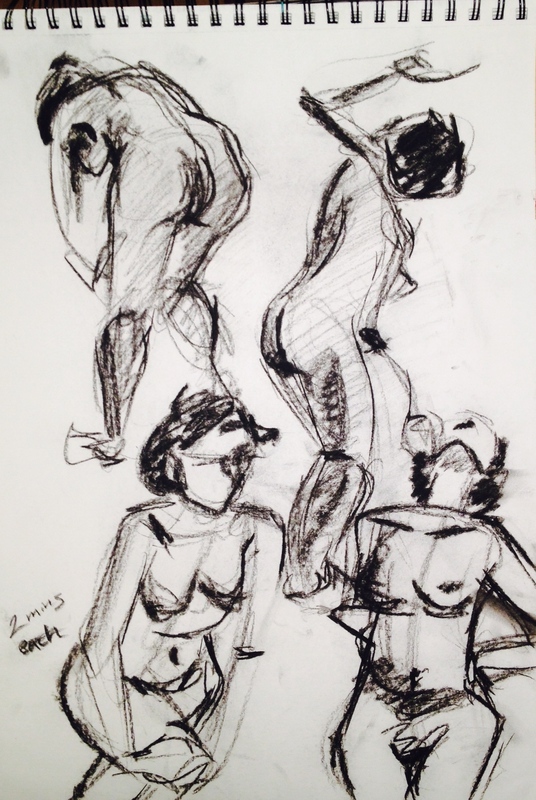 I thought I’d update my website and post a couple pictures to share the excitement and rush of warming up with gesture drawings before a life drawing class. Gesture Drawings are quick sketches that usually last between 30 seconds and 3 minutes per pose. The goal of a gesture is to capture the ENERGY of the model’s pose and aim for general PROPORTIONS. 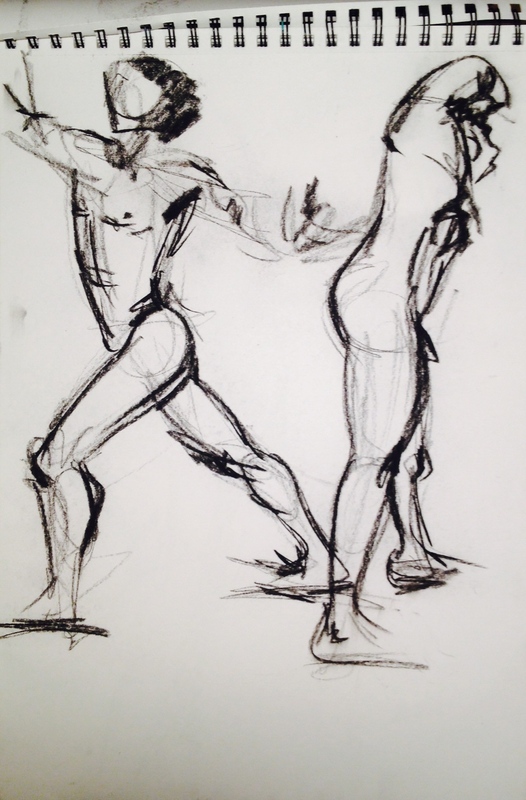 The examples above are 2 minute gesture drawings, used to loosen up before moving on to longer 30 – 60 minute postures. When people know they have AN HOUR to complete their drawing, they take their time, measure the proportions, and think before every stroke and shadow. With only 30 seconds for each posture, the careful uptight artist is forced to feel the drawing rather than calculate it. Even for long poses, you should start with a gesture in the beginning. Otherwise, the rest of your work is screwed… The proportions and energy must initially be correct before all the detail can transform a good sketch into an amazing piece of art. Personally, I’ve always been fascinated with good sketches that are 10 minutes or less. It’s amazing how little detail and shading you actually need to recognise the human body and it’s posture. The University of London Student Union does some cheap classes on Wednesdays, so I definitely plan on starting back up soon! Plus, it’s always hilarious to see people’s reaction when you tell them one of your hobbies is drawing naked people. (You can discover a lot about someone’s personality based on his or her attitude to the raw human body.) And that’s why I love art. It makes people feel awkward… pushing them outside their comfort zone.